RIO GRANDE VALLEY, TEXAS – JUNE 12, 2018 – Hurricane season is underway, and professors at The University of Texas Rio Grande Valley are researching ways to help the community deal with potential storms. Dr. Dean Kyne, Dr. Arlett Lomeli, Dr. David Wladyka and Dr. Katarzynia Sepielak, of the UTRGV Department of Sociology and Anthropology, along with Dr. Owen Temby of the UTRGV School of Earth, Environmental, and Marine Sciences and the Department of Political Science, are studying the Rio Grande Valley's hurricane resiliency – the ability to prepare for and bounce back from hurricanes. “Without resiliency, it may take years and years in the building, recovering and rebuilding process,” Kyne said. The first step in measuring hurricane resiliency is defining it and agreeing on its indicators. Two graduate students already are collecting data from key stakeholders, like county and state officials. After analyzing the data collected, the professors hope to move to the next step: measuring the Rio Grande Valley’s current level of hurricane resiliency. “Once you are able to measure the current state, then we can think about, “Well, this is the current level of our resilience? What are the areas where we can improve?’ We can set the goal. We can set the numbers and we can move forward. 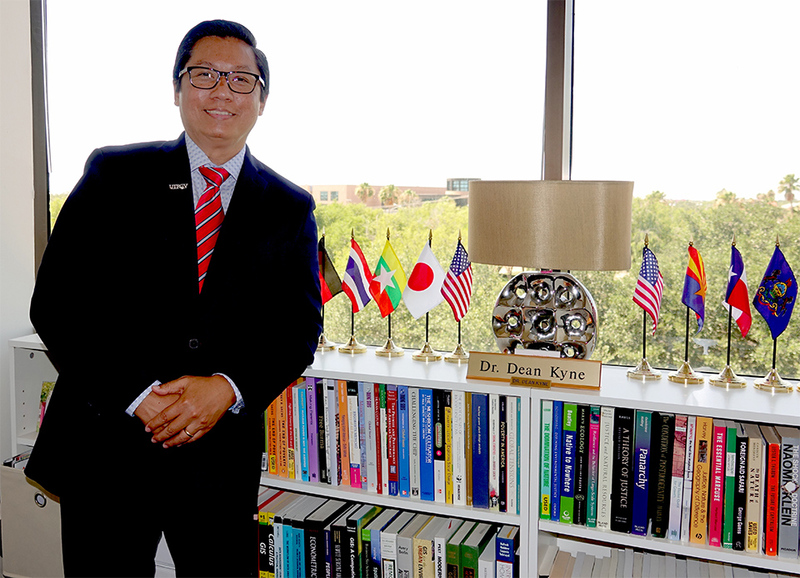 And, we can work together in order to build more resiliency, or we can retain all the resiliency that we have built in the past years,” Kyne said. The study is not the first one UTRGV professors have conducted to help with hurricane preparedness in the Rio Grande Valley. “That study shows evacuation decision-making is not as simple as one might think,” Kyne said. Factors people consider when deciding whether or not to evacuate include what they identified as safe places, the material their home is made of, what floor of an apartment building they live on, and the amount of help they expect to get from the government or other agencies after the storm. Age and level of education also had an impact on the decision to evacuate or not. The researchers also identified the following seven reasons people would not evacuate the area because of a hurricane. A pet that can’t travel or they don’t want to leave alone. Not wanting to leave their belongings. No friends or relatives living in places outside the evacuation zone. Elders who wouldn’t or couldn’t travel. Family member unable to travel due to a disability or medical condition. The paper also included a geographic distribution of people willing to evacuate during a hurricane. “I also would like to emphasize one finding that is very helpful for the authorities - the recommendation by the authorities to evacuate. You can that see many people indicate willingness to follow the recommendation made by the authorities,” Kyne said. Along with this research, UTRGV offers a Master of Arts in Disaster Studies, a program that trains those interested in emergency management roles. Last year, students assisted with Hurricane Harvey cleanup and spoke with Corpus Christi officials about the decision process during the hurricane. You can learn more about the UTRGV master's program at http://www.utrgv.edu/sociology/graduate/disaster-studies-ma/index.htm.